Protect your indoor air quality with expert acoustic ceiling removal in Villa Park CA. When it comes to lumpy, bumpy acoustic ceilings, there may be more than just an ugly interior design choice to worry about. These types of ceilings sometimes contain asbestos, especially in older properties. The good news is that with careful acoustic ceiling removal in Villa Park CA from AQHI Inc., you can keep your indoor air free of asbestos contamination. By removing the source of the asbestos contamination, acoustic ceiling removal in Villa Park CA can obviously help make your property safer. However, you must choose a quality contractor for this to be true. All too often, inexperienced individuals actually make contamination worse by using improper asbestos removal methods that generate lots of dust, or by failing to properly clean the area after work is complete. 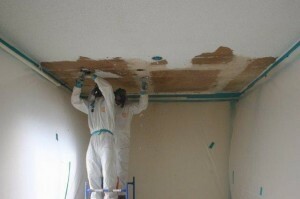 At AQHI Inc., we have over 20 years of experience in acoustic ceiling removal in Villa Park CA. But you don’t have to take our word as the only proof of our skills and knowledge–our status as a licensed and certified asbestos contractor covers that. We carry full insurance, including insurance for our vehicles, so you never have to worry about our work exposing you to liability issues for injuries or for pollution. Instead we pledge to leave your property clean, safe, and ready to reoccupy. There is no job too big or too complex for us to handle. Our asbestos removal office for Acoustic Ceiling Removal in Villa Park CA is open Monday through Friday between 8:00 AM and 5:00 PM and closed for lunch from noon to 1:00 PM. With advance notice, projects can be scheduled for weekends, early mornings and evenings.